Analysis of raw documents I was able to obtain through an open records request shows that the county’s departments and elected officials have requested $3.3 million more for Fiscal Year 2015 than was budgeted for the current fiscal year. The county transferred $627,636 from its reserve funds to balance the current budget, and it has used that procedure to balance the budget since the economic collapse of 2009. The public hearing tomorrow night is the first chance citizens will have to see how the Board of Commissioners plans to balance the budget this year. The public hearing on the budget is to start at 6:30 p.m. in the courthouse in Watkinsville and be followed by the regular meeting of the Board of Commissioners. The agenda for the regular meeting includes BOC preliminary action on the project list for the 2015 Special Purpose Local Option Sales Tax referendum and discussion of a $12 million loan from the state to pay for continued construction of the Hard Labor Creek Regional Reservoir in Walton County. The agenda also lists as a discussion item the Fiscal Year 2015 budget, which is the sole topic of the public hearing. At the budget hearing, Finance Director Geddings can be expected to go over the outline of the budget that the Commissioners are scheduled to adopt at their next meeting on June 3. Following Geddings comments citizens will be given a chance to respond, though they will be doing so based solely on the oral presentation. “Copies of the FY15 Budget will be available immediately after the first public hearing,” Geddings wrote me in an email message on Friday. The budget will list fees charged for use of the county’s parks, for various types of permits, and for water and sewer rates. These fees are part of the budget revenue projections. Chris Thomas, Utility Department director, proposed water and sewer rate increases of 3 percent when he presented his budget request in March. If approved by the BOC, the water rate increase will be the seventh in as many years for the county, and the sewer rate increase will be the sixth in six years. 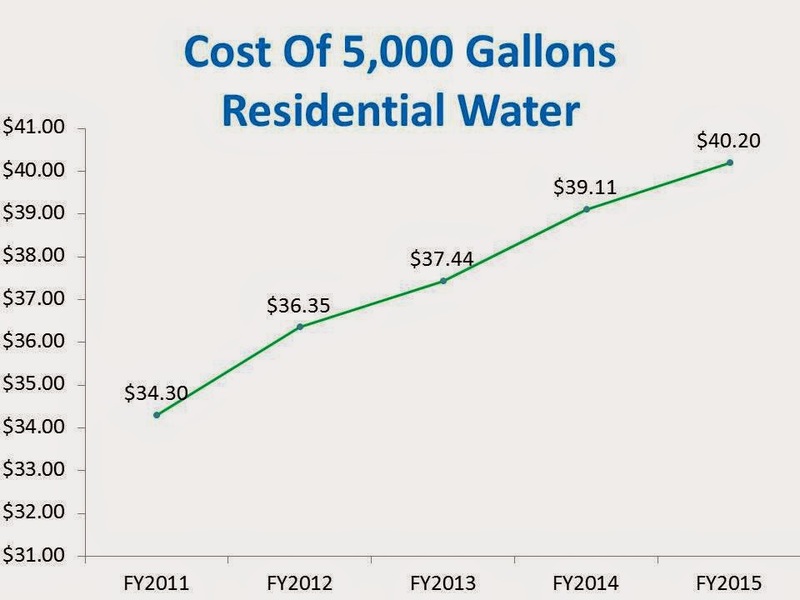 Thomas told me after the March presentation that an “average” Oconee County residential home owner uses about 5,000 gallons of water per month. The chart, based on data given me by Thomas, shows how the costs for that “average” homeowner will have increased over the last five years if the new rate is approved. Part of the increase in the water budget is for debt service to cover the costs of the Hard Labor Creek Regional Reservoir now under construction in the southeastern part of Walton County. Jimmy Parker, manager for that joint project involving Walton and Oconee counties, is scheduled to be at the BOC meeting tomorrow night. The state gave the two counties $32 million in two separate loans in August of 2012 for construction of the reservoir. The counties already have taken the larger of the two loans, for $20 million, and they now are being asked to accept the remaining $12 million loan, with 2 percent simple interest. The Hard Labor Creek Management Board voted at its meeting on April 22 to ask the governmental bodies of the two counties to move forward on the increased debt. Oconee County’s share of the $12 million will be 29 percent, or $3.5 million. The largest item on the list is $12.1 million for the Utility Department, followed by $12 million for roads (Public Works), and $8.75 million for parks and recreation. The county is projecting that $55 million will be generated by the 1 percent sales tax, with the county’s share being $47.3 million. The remainder goes to the county’s four cities, with the formula based on population size. The last open discussion of the Fiscal Year 2015 budget was in March, when the BOC met with department heads and elected officials to hear their requests for funding for the new year. Those meeting, held on March 17 through 19, were open to the public, but no details of the budget requests were released to citizens before or after the meetings. County Administrative Officer Jeff Benko told me in email messages last week that he had been involved in a series of meetings with the four voting Commissioners and with BOC Chairman Melvin Davis on Thursday and Friday to discuss the final budget details. Benko said the week had been particularly busy because of the BOC’s work session on SPLOST priorities on Wednesday night. I asked Finance Director Geddings, in an email message on May 15, if he would make available to me a “spreadsheet listing all of the budget requests for FY 2015" so that I could be prepared for the public presentation of the budget. Geddings wrote back the next day, copying Benko, saying that, rather than give me the summary list, he would give me the budget requests “in original form” if I submitted an open records request. I wrote Geddings back that day and told him I would file the open records request. I also asked him to confirm that I could get the information I need from the cover sheets of the budget requests, since those cover sheet contains the summary of the budget request. Geddings did not reply, but I saw him outside the courthouse on that day, May 16, as I was leaving the office of the Board of Elections and Registration. Geddings confirmed that the summary information was on the cover sheet and told me that, since there were 26 departments, this would be an efficient way for me to get the information I needed. I filed the open records request, asking for the cover sheets, that evening, May 16. I received an email message from Jane Greathouse, county clerk and open records officer, on May 21. Greathouse included an invoice for 92 pages at 10 cents per page and 1 hour of search time at $13 per hour. The first 15 minutes of search time were subtracted from the total, based on state law. The total cost was $18.95. I told Greathouse I would pay the amount billed, but I indicated that the amount differed from the amount I expected to pay, based on my conversation with Geddings. “I am not allowed to create documents for Open Records requests, but to submit the existing format,” he wrote to Greathouse. The law says the government agency is not required to create documents to respond to an open records request, meaning Geddings did not have to give me the spreadsheet I had requested initially if he really had not created one. “The exact amount of time and number of pages required is always unknown until the search and retrieval process is complete,” Geddings said in his response. Greathouse forwarded that response to me. The 92 pages I received included duplicate, replacement budgets for 10 departments. Some of the pages even contained hand-drawn lines through them, indicating they had been replaced. The Law Enforcement and Parks and Recreation Department budgets were produced so that the subparts were summarized in the cover sheet, making the subparts unnecessary to understand the cover sheet. I also obtained cover sheets for budgets that are not included in the listing of the Fiscal Year 2014 budget that is on the county’s web site. Geddings provided no explanation for why it took an hour to find and copy 92 pages that had not been scrutinized to eliminate the redundant materials. I picked up the 92 pages of budget requests on Friday. In the evening of the day before, I asked Geddings in an email message if he would give me “the projected revenue figure that you are using” for the Fiscal Year 2015 budget. 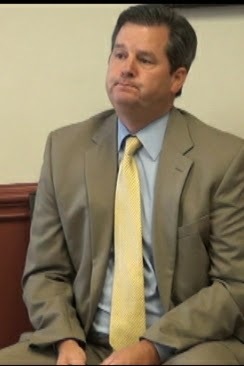 He responded the next morning by telling me that the first public hearing would be on May 27. He also told me that the budgeted revenue for the current fiscal year is $21.4 million. I responded and said my question was about the projection for the upcoming fiscal year. His reply was that copies of the budget will not be available until after the first public hearing tomorrow night. Geddings told the county’s Industrial Development Authority last week that the change in the state law on payment of property taxes for automobiles has made projections of county revenue difficult this year. The projections are an essential part of the budget, since Geddings has to tell the BOC how much money he expects the county to receive in order to help it decide how much money it can budget to spend. The budget Geddings’ office has on the county website uses the $21,386,151 million figure for spending, balanced by $20,759,515 in revenue and the transfer of $627,636 from the fund balance reserve. The BOC will have to weigh projections of revenue growth from increased property valuation, the size of the fund balance, and possible tax and fee increases as well as reductions in budget spending requests. I used the documents provided by Geddings in response to my open records request to create the spreadsheet he indicated he did not have. I used the budget categories for last year’s budget and matched them to the materials on budget requests. The cover sheets from the officials and department heads list last year’s budget amount as well as this year’s budget request. In five cases, shown in yellow in the spreadsheet below, the amount of money listed on the Fiscal Year 2015 budgets for Fiscal Year 2014 funding did not match the document on the county web site. The figure was in each case somewhat higher, reflecting, it seems, adjustments in the budget as the year progressed. The order of requests in the spreadsheet is the one used by the county. I calculated the amount of increase and the percentage of increase reflected in the request. The Utility Department is listed separately at the bottom of the spreadsheet, since it is funded not out of the general fund but by its own revenue. The largest amount requested in Fiscal Year 2015 is by the Sheriff’s Office for law enforcement. The jail, also under the sheriff’s control, represents the fourth largest request. The Parks and Recreation Department and the Public Works Department rank second and third, respectively, in terms of the size of the budget. The Information Technology Department is asking for the largest amount of new money, for new equipment, followed by the Parks and Recreation Department and the Sheriff’s Office. Information Technology and Parks and Recreation departments also are near the top of the list in terms of percentage of increase in funding requested, topped only by two units with small budgets, the Coroner and the Oconee Area Resource Council. The spreadsheet is available for download here. Did Benko meet with the Commissioners as a group or individually? If as a group was the meeting announced? Why can't Melvin Davis, Jeff Benko and Wes Geddings ever opnly share information with the public? Why do they intentionally hold info., over and over again? Why the constant subterfuge? Shouldn't Tea Partiers raise some cane about this regular practice by Melvin, Benko and Geddings? They constantly obfuscate, and the other four commissioners and county Republican party allow them to do so without recourse. Shameful! Also, it's not very conservative Republican to raise taxes seven/six years in a row!! "Chris Thomas, Utility Department director, proposed water and sewer rate increases of 3 percent when he presented his budget request in March. If approved by the BOC, the water rate increase will be the seventh in as many years for the county, and the sewer rate increase will be the sixth in six years." It is obvious that they don't want informed citizens and they want to discourage the open records requests which is why they don't provide what is requested so they can charge Lee more. They definitely lean toward the "leaders know best" philosophy and would rather the citizens stay "dumb". They keep getting reelected so it works for them.